"To make the best better" is the motto of the national 4-H program. 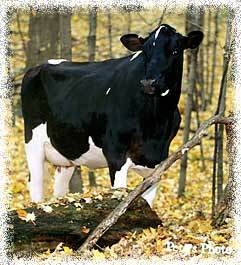 It's also one of the guiding principles used by Larry Jerome in his development of the Jerland registered holstein herd. The registered holstein Jerland herd - with a RHA of 30,025 milk and home to world record holders - draws attention from Holstein breeders worldwide. The milking herd consists of approximately 100 cows. Jerland Farms has developed 72 animals classified Excellent; 54 of these Excellents are home bred. Jerland Starlite Revelle is the foundation of our famous "R" family. Revelle has 31 Excellent and 51 Very Good progeny. Currently, there are 39 Excellents in our herd. Our cows not only have outstanding type ratings, but are serious milk producers as well! The standard at Jerland is set at no less than 100 lbs per cow per day average output for the entire herd.